rebar rings how to bend. I have just found this site and it looks interesting. I have been welding more as a hobiest welder for a great many years and still am learning. Thanks to sites like this it is a lot easier to learn new things. I have been retired from an Elect company for 8 years now and don't have time to do anything or maybe it just seems that way. My welding equiptment consists of a Lincon idealarc 200 wire feed that I purchased used about 25 years ago and a Miller syncrowave 250 that I brought 10 years ago, also a thermal dynamics Econo Pak 50 plazma arc cutting tourch. The O/A tourch I have had for close to 50 years and it still works well. I also have a lathe and mill and other tools. I am pretty well set up to stay busy. Looking at some of the pic that have been posted here and on other boards. I have seen some flower pot holders that I would like to build. The question is do any of you fellows have plans or advice on building a machine that I could roll rings from rebar that you would care to share? I would appreciate any and all help that is offered. I hope that I am not doing any wrong but I will post a link to my web page and you can see what I am up too in shop. At the bottom of the first page is a link to photobucket.com that has some pic. I don't have any idea how to bend rebar but welcome to the site, maybe DDA52 or someone else who works with rebar will be along with some ideas. Being retired is good, I have been retired for going on 3 years now and it's for sure the best job I ever had. Depending on how tight you want to make it, a regular old ring roller may do what you want. Don't have one??? Well, do a search on Hobart or maybe Ask Andy and there are some plans floating around for a few models. A poorboy method would be to bend it around a pipe. Will take a fair bit of sweating, but it can be done. I would opt for the ring roller. At least after you made a few, you would actually be able to do something other than lie on the floor. Thanks for the welcome guys and the replys. I have some ideas for building the rings but always find ways that the idea will not work. The rings I want will be assorted sizes but mainly for 20 inches down to maybe 6 inches. They will be sized to fit various size flower pots. Thanks again, and I will keep thinking and looking for ideas. Still have not found any information on building a rebar ring roller yet so I am going ahead and drawing up one using some ideas that I have. The one problem that I think I will have is getting the roller to feed the rebar. I am thinking of maybe cutting some groves in one of the rollers something like a gear with shallow teeth. Befor cutting the teeth I am going to see if feeding the rebar does present a problem. I know they use a rubber roller on their drive roller, that should help feed the rebar? 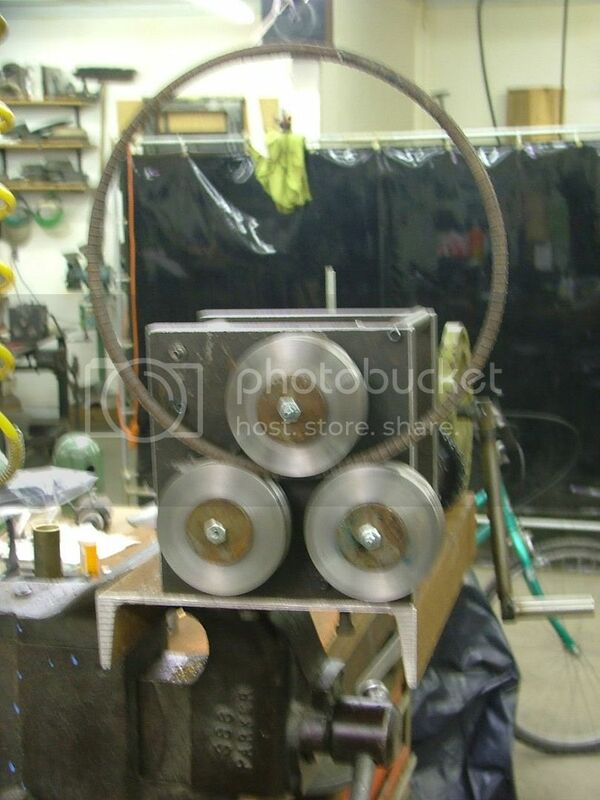 Some where on the web I saw plans for a ring roller??? Did you do a google search yet? I look around and see if I can find it. I started the rollers to day. The rolls have been faced and holes bored for the shafts also worked on the frame some. Have it in the mill and have worked one edge stright. Have to go to the big city tomarrow so that is a wasted day. I am getting the shop ready to paint the outside so Friday is taken up also. I tell this project is going to take a long time to complete. Oh well it will keep my out of the bars and from chasing those nasty ol women. In my welding class I learned a fast and easy way to make a bunch of rings. We use a Rigid pipe threader machine, My teacher made a jig for it using a 2 inch pipe for the shaft and a bigger sized pipe(any size you need) welded to the shaft to make the ring guide, then you clamp the rebar to the bigger pipe w/ a vise grip and bend away using the foot pedal, but be carful cause it can get away from you if you do it to quick. After you do that it should look like a spring, then you cut it using a torch or I recommend a hand held band saw, voila you have rings the quick and uniform way. Thanks Mossyoak, here is what I finally came up with. You can roll different size rebar if you want to make the dies for the size that you are going to bend. What you discribe seems like a good way also but as you said it could bite you bad. Dam that picture link did not work well at all, sorry. Last edited by Charlie C; 12-09-2006, 07:41 PM. hey...this is my first post to this forum...This is great! do you know what size the pulley would need to be for a 10" ring? Last edited by CrazyQ; 12-30-2008, 07:17 PM. If it helps, rebar in the US comes in different grades. Grade 40, grade 60, grade 75, and ungraded. The numbers basically stand for the yield strength in thousands of psi. More importantly to this thread it means how easy it is to cut and bend. Grade 40 cuts and bends easily compared to grade 75. Ungraded can have hard spots in it etc. I used to buy it here by the ton or by the thousand feet from the steel mills when I was building commerical and had to designate the grade. HTH.